erniemcpeck - Adventures in Switzerland: Review - Holy Cow! With two locations in Lausanne, Holy Cow! is essentially a gourmet burger restaurant. As someone who likes the kind of food served in McDonalds and Burger King, this is right up my street. In all honesty though, it doesn't deserve to be mentioned in the same breath as those fast food peddlers - Holy Cow! 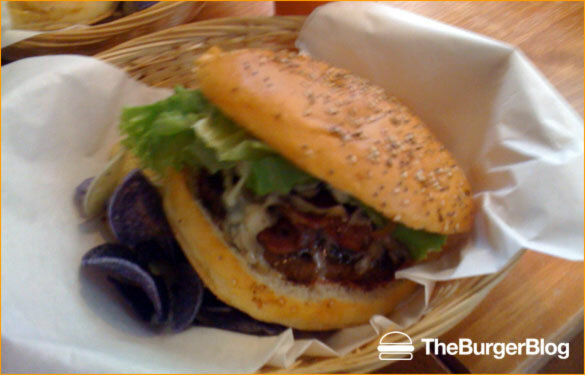 is in a league of it's own when it comes to burgers. I have eaten at the Holy Cow! a few times since I moved here, and I have never been disappointed. My brother-in-law first described the food to me in 2009 as delicieux, and convinced me to try it with him (didn't take him long to convince me, to be fair). The Holy Cow! prides itself on sourcing it's meat locally from the canton of Vaud, and burgers are freshly prepared on site, adding to the succulent taste of the food. ﻿The burgers all have different names, such as the Elvis Blue Cheese and the Smokin' Holy Cowboy (both of which I have tried and loved). The menus are written in French and English, as is their website, and the staff can all speak English to help out hungry tourists. Price-wise, Holy Cow! is not particularly cheap. I had a Smokin' Holy Cowboy burger and meal for 24.- CHF. Admittedly this was because I paid an extra 5.- CHF to have a double burger, but even at 19.- CHF it's still pretty pricey. However, the old saying that you get what you pay for is certainly true here, as you are paying for sheer quality. In terms of seating, the newer restaurant has a few tables with benches, but these fill up really quickly at lunch and dinner times. I arrived at 12:05pm once and the tables were already full. The original site has one small area inside the restaurant for eating, basically big enough for about three people, so you are pretty much obliged to take your burger away with you. In fairness, every time I have eaten at Holy Cow! I have eaten my burger elsewhere (which is fine if it is a sunny day). Loads of information about Holy Cow!, including the menu, can be found on their website. As mentioned above, there are two Holy Cow! restaurants to choose from in Lausanne, so I have listed both below. Site 1 - the original Holy Cow! 05 / 10 - Price - the burgers are pretty expensive... but worth it! Overall - 6.6 / 10 - it is expensive and you'll have to eat your burger as takeaway, but the deliciousness of the food makes it worth the trip. 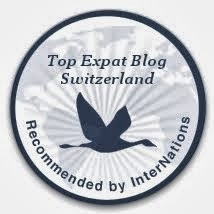 A massive thanks to InterNations for recommending my blog as a top expat blog for Switzerland! An Englishman living in Switzerland, trying to instill Britishness in his daughter and deal with life's daily challenges. A Cake fit for a Princess!